The ball field at Park Point was frost-covered as our group was arriving at 7 for Duluth Audubon's fourth Spring Warbler Walk, but the sun was shining, there was no wind, and by the end of our walk, I was starting to feel uncomfortably warm in my long johns and knitted Chicago Cubs scarf and hat. We had a lot of ducks, way way out, most beyond the distance of conjecture, at least for me. But we had pretty looks at Bufflehead and Common and Red-breasted Mergansers, and were feeling a little certain that a bunch of the distant scaups were Greater before a boat conveniently (for us) scared up all the ducks—solid looks at the wing patterns made me certain of a bunch of Greaters and some Lessers as well. A nice, if distant, group of Horned Grebes out in the water gave us some pleasant looks when they banked just right—all that glare was a little tricky to deal with. 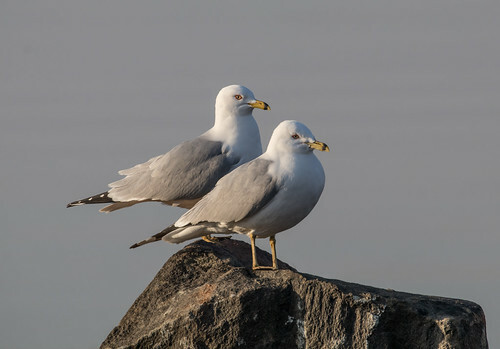 The Ring-billed Gulls gathered on the ball field were all adults, and some were proving the truth that gulls just wanna have fun. Just about every time we scrutinized the flock, one pair would be copulating. We were too far away and the light too glaring for graphic photos, but you can sort of tell what's happening, with the male on top. The other gulls are trying to act all nonchalant, as if it isn't some horrifying faux pas for birds to be mating right there in public at breakfast. 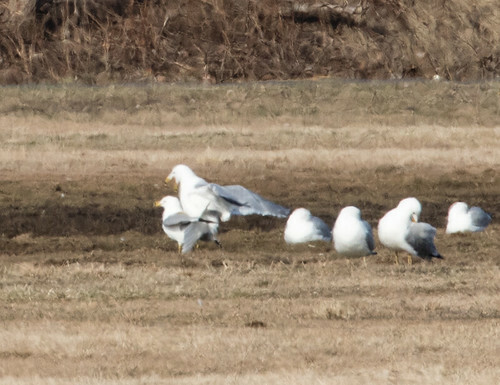 But it really wasn't a faux pas in the world of Ring-billed Gulls, unlike some other species I could name. Flickers seemed to be everywhere except close enough perches for nice photos. We didn't see any feeding on the ground—it was probably too frozen still for ant activity, at least in the morning. They did lots of calling and some flying past. We got skunked on other woodpeckers. Our walks are nice and informal, so people join us as they can, and leave as they want or need. People still with us as we worked our way back to the parking lot at the end got at least glimpses of our "best" species (in terms of rareness) of the morning, a Brown Thrasher. He did not approve of paparazzi or of birders in general, but gave just about everyone a glimpse of his long, rusty tail as he hightailed it out of view. 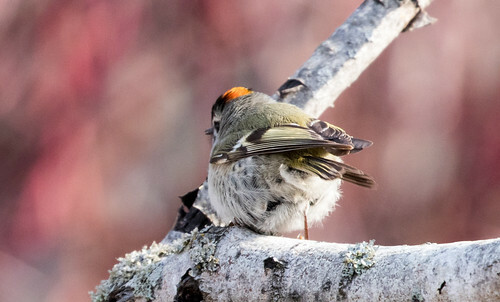 People near the front of our group saw more rust on his back and wings (Hermit Thrushes are a duller brown except on the tail; Fox Sparrows are smaller and chunkier), and one of the experienced birders of our group heard him singing softly for a bit. 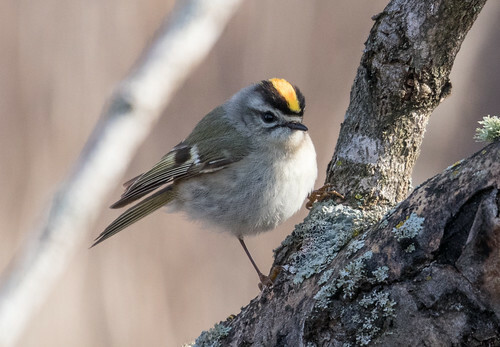 I think everyone in the group would agree that the Birds of the Day were the Golden-crowned Kinglets we saw at the far end of the ball fields near the paths that go through the dunes. 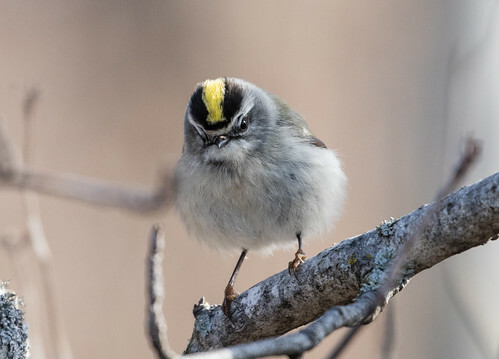 The kinglets flitted about at close range, giving everyone pleasing views of their crowns, bright yellow in the females, yellow and golden red in the males. 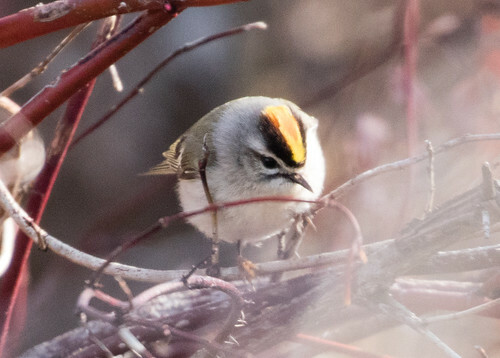 Their quick movements in and out of the tangles of vegetation made photography tricky, but with bird photography, trying is half the fun. 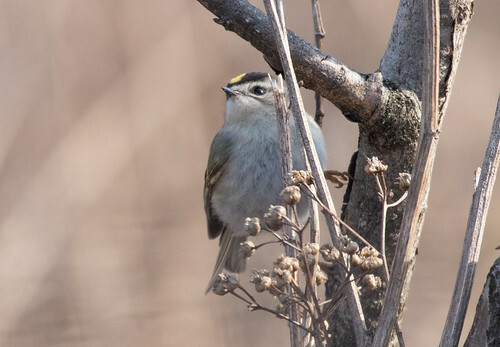 The 29 species we saw in the area around the ball fields and behind the recreation center almost doubled the number of species we saw here last week (15). Aythya sp. (Aythya sp.) 100 Large raft of ducks, backlit and in glare--when a boat disturbed and they flew, I could be sure of many, but not sure about at least half. duck sp. (Anatinae sp.) 300 large rafts in the bay and on the lake that we couldn't get a clear look at with the sun's glare. A few of us made a little extra stop on the way out, turning at the stop sign where the old Bayside Market was to check out the public access to the Bay. This little stop added three more species, bringing our grand total to 32!